The Albert Nerken School of Engineering has entered into a "memorandum of understanding" with the Graduate School of Biomedical Sciences at the Icahn School of Medicine at Mount Sinai (ISMMS) that will allow students from both schools to take courses for credit and perform research at the other institution, it was announced this week. "This exchange is great for our students and it's great for New York City," Richard Stock, dean of the school of engineering says. "By opening up specialized bio-medical labs and courses to our engineering students, while offering our world-class engineering resources to ISMMS, we continue to bolster this city as a major location for STEM research." 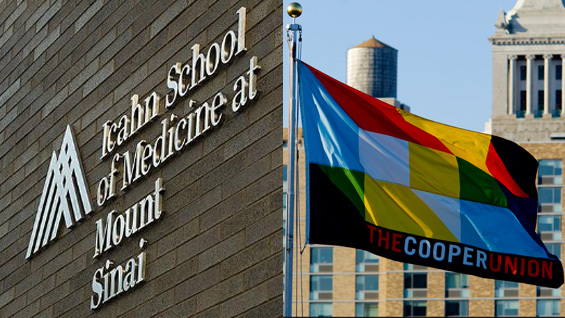 ISMMS, located on the Eastern edge of Central Park, is the medical school for the Mount Sinai Health System, which includes seven hospital campuses, and has more than 5,000 faculty and nearly 2,000 students, residents and fellows. It received $348.5 million in National Institutes of Health (NIH) funding awarded to its researchers in 2018, 12th among U.S. medical schools for NIH funding, according to the ISMMS website. Pending approvals by course directors and other relevant officials at the home and host institution, students will receive equivalent credits from the exchange. "The credits will be applicable to towards one's degree, pending advisor approval," Anita Raja, associate dean of research and graduate programs, who led the effort to formalize the relationship, says. "This will open up hundreds of courses to our students in fields like health and medicine, while ISMMS students get access to our specialized knowledge in tissue engineering, machine learning, and data science, among others. This will lead to larger, better funded research opportunities for students and faculty alike." The exchange came about after several years of an informal relationship between the two institutions. "We have many graduates that have gone on to pursue an MD at ISMMS, making us something of a pipeline for them, " Raja says. More recently a number of research projects have sent Cooper students to the labs at Mt. Sinai. Presently two mechanical engineering students are collaborating with members of ISMMS on developing a better skull clamp. Past projects include a portable incubator system for growing cells, and a bioreactor for growing lung tissue.